Just a few months ago, a small but dedicated group of video game fans, spearheaded by mastermind Stephen Kennedy, released their first collection of newly arranged versions of classic game music. Let's face it, it's hard to get game music outside of Japan. Sure, there are some domestic releases nowadays, but they tend to be on the skimpy side. 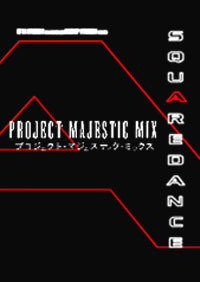 Rather than sit around and keep hoping that game music will hit the domestic mainstream, these fans came up with "Project Majestic Mix." Their goal is to present high-quality video game music that fills up an entire CD at an affordable cost locally. Now that I own the second release in the Majestic Mix series, it doesn't seem like an impossible goal to attain. Much of the development was influenced by fellow enthusiasts (myself included) able to voice opinions at the project's website over the past few years. Now that they've gotten the ball rolling, they're back with another, this time more under the control of Stephen's partner in crime, Mustin. Unlike the first album (A Tribute to Nobuo Uematsu), which featured a wide variety of styles and arrangements for each track, Squaredance is unsurprisingly composed of only dance and techno remixes of some fantastic tunes. This set (as well as the set before it) was funded entirely by fan donations, and those who reserved Squaredance early were able to snag a special two disc version containing even more Square goodness than the standard general release edition. In order to fund this endeavor, and because I like special limited edition stuff, I went ahead and plunked down $46 back in August and waited patiently for my music to arrive. Boy, was it worth the wait and cash. First, we need to discuss the packaging. If anyone out there has seen the DVD keepcase for the special version of Jin-Roh, or Fight Club, then it's just like that. For those of you who are missing out on those great movies, it's a hard cardboard folding box that has plastic disc keepers and a pocket on one fold. The design is very stylish and professionally impressive, and it comes with a thick booklet detailing the history of the project and loads of additional information concerning each track. In my set, they also threw in a Certificate of Authenticity (458/1000), a business card hyping the next album coming from these guys (Time and Space - A Tribute to Yasunori Mitsuda), and a card with a handwritten thank you note from Stephen, signed by himself. Not too shabby, when all is said and done. Ah, but what about the music? After all, it's the thing that brought us all together in the first place. Well, I'm happy to report that the songs are pretty damn good. I like Techno, though when things get too repetitive I tend to get bored, but I was very pleased with each of the arrangements. These re-imaginings of the original songs work very well and cast a unique light upon themes that many gamers know and love. My favorites both come from the second disc oddly enough - "Mechanicalcobrena," from Final Fantasy IV (originally "Dancing Calcobrena") and "This Day," from Secret of Mana (originally "What the Forest Taught Me"). The latter song was always a favorite essentially because it was one of the songs that was easy enough for me to play. However, older games aren't the only titles represented in this set. There are remixes from Chrono Trigger, Chrono Cross, Final Fantasy II, IV, V, VI, IX, Adventure, and Mystic Quest, Parasite Eve, Secret of Evermore, Secret of Mana, and Super Mario RPG. There are sample tracks available for download at http://www.kfssstudios.com, so I'd suggest you check it out if you have any love for video game music. Just as the last release, this is clearly a labor of love crafted with skill and care. I can't wait to hear what great stuff Project Majestic Mix will release unto the world next.